Normally when we’re first in London, we can’t sleep at night and get our best rest in the morning from about 4 a.m. to noon. That’s because it’s nighttime in Chicago. But this time, we slept well on London hours and woke up relatively early in the morning. The mattress at the Club Quarters Gracechurch was mighty fine. Arsenal v. Everton was to begin a 5:30, so we had plenty of time to kill. 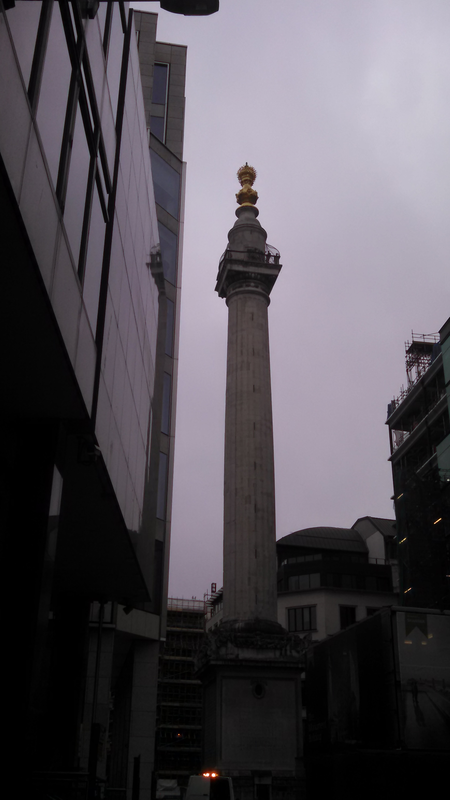 We had a quick breakfast and headed over to the Monument for which the tube station nearest our hotel was named. The Monument was erected sometime before or during 1677 in remembrance of the Great Fire of London Fire in 1666 and was designed by Christopher Wren, also the architect of St. Paul’s cathedral. We had noticed yesterday that you can walk up the 311 steps of the tower to get a great view of the city. Entrance was £4 per adult, requiring cash. That fee represented the only cash we used while in London this weekend. Virtually everything else could be bought using plastic. We climbed up stair after stair. At some point my husband wondered aloud why we were paying someone to walk up all these stairs. It was well worth it in the end. I do not enjoy heights, but the views were so terrific, we stayed at the top for quite a while. Plus, it was completely fenced in with chicken wire, so it felt safe even to me. A mom from the Netherlands and her son were the only others at the top when we arrived. We took a great many photos, moving the phone camera’s lens as close as possible to the chicken wire for unobstructed photos. Most remarkable was the number of cranes nearby and on the horizon, far more than you could count. London is completely under construction. The other people I saw coming up the tower were all parents with young children. Parents always seek activities that will tire their children out, but it seems it’s never possible to tire out your kids without tiring out yourself more. One of life’s many unfair algorithms. We did some additional walking around our neighborhood before taking the tube to have lunch with my former boss near Russell Square. Although many of my bosses across jobs have been fired, and a few were promoted, and a few left the company on their own speed, an oddly large percentage of my bosses have relocated to London. (“Hello there! It’s come to our attention that you are the boss of Amy O. Would you prefer the pink slip or the relocation to London?”) One such boss relocated to London recently. I am confident he was not the subject of the scenario I just laid out. We met him and his wife at their temporary housing and walked to a cool Spanish gastro pub called The Eagle. I had a glass of Rioja and a lamb tagine, very yummy if a bit spicy. My husband had pheasant. I forget what the boss and wife had, but it was certainly pretty. 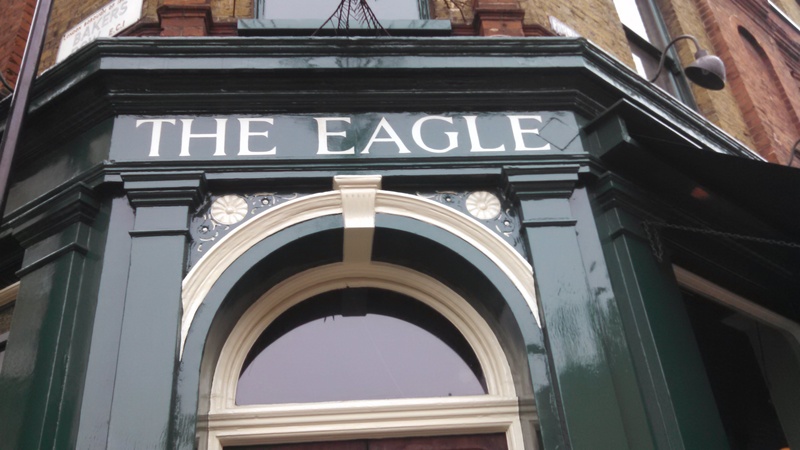 This was the first pub I’d been in that was frequented by a great many well-behaved dogs. We had a good gossip and then walked over to the Angel tube. True to normal match-day weather, the sky was starting to spit raindrops. When my husband attended the Olympiacos match with a friend, he stayed in Camden, and he thought I’d enjoy wandering around there. That was fun. Kind of like I imagine Mardi Gras, with no parade. Trinkets, tattoos, piercings, brightly-colored mohawks. I refer not only to the shops and services available, but also to the people thronging the streets. We walked along the main drag and then along the canal. He had shown me many photos from his time on the canal, but I didn’t quite understand the spirit of the place until I was there. I have never seen anything quite like the houseboats along the canal, with larger belongings strapped to the roof–bicycles, strollers, sculptures, Christmas trees. The houses along the canal were opulent but also nicely off center, with palm trees, tree houses. There was a pirate castle and a pagoda restaurant perched on a pier. It would take a long time to take it all in; we did our best, but time was a commodity in short supply. We returned to the Camden tube station and were pushed along in a big crowd through the turnstile and down to the train. It was time to make our way to the Emirates.